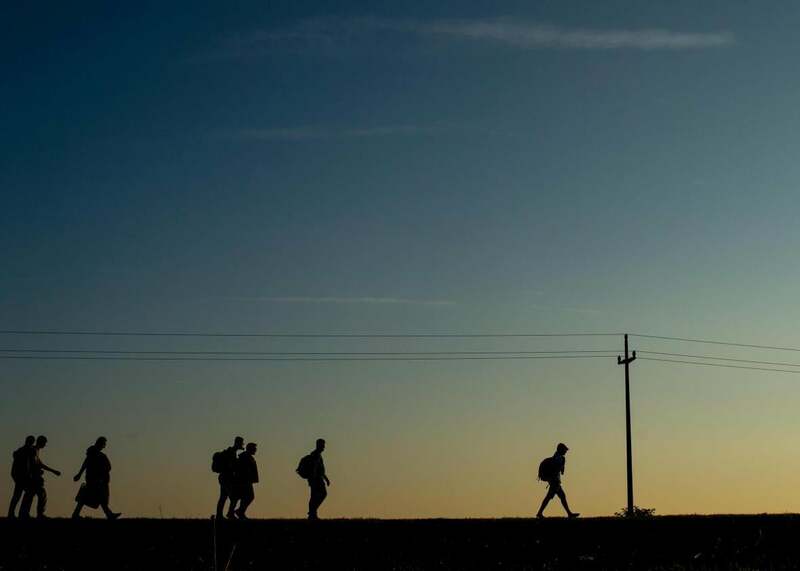 Migrants walks the last kilometres towards a refugee camp after crossing the Croatian border with Serbia on September 22, 2015 in Opatovac, Croatia. European Union ministers finally approved a plan today to distribute 120,000 refugees across its 28 member states, but the plan falls far short of what’s needed to address the crisis and risks exacerbating the political divisions tearing the continent apart. The mandatory system would apportion refugees to countries based on their population, economic strength, unemployment rate, and the number of asylum applications they’ve already approved over the last five years. It’s meant to ease the burden on arrival countries like Greece, Italy, and Hungary—which have been overwhelmed with new arrivals from Syria and elsewhere due to their location on the edge of Europe—and places like Germany and Sweden that have voluntarily taken in large numbers of refugees and are the intended destination of most of them. France and Spain, in particular, would have to take in significantly more refugees under the plan, which they have agreed to support. The countries are also discussing significantly expanding fingerprinting efforts and creating more reception centers in Greece and Italy to assess asylum claims. It does not apply to Britain, Ireland, and Denmark, which have opt-outs from the common asylum system, though they’ve made pledges of their own. The plan passed by majority vote with Hungary, the Czech Republic, Slovakia, and Romania voting no and Finland abstaining. Eastern European countries, with little experience in accommodating large-scale non-European immigration, have been extremely hostile toward European pressure to take in more refugees. The new plan would compel them to take people in against their will, something that is likely to further deepen tensions within the bloc and could lead to further backlash against Brussels and the reimposition of border controls within the union. Even so, the plan doesn’t come near to addressing the scale of the crisis, which has seen nearly 500,000 people entering the EU so far this year to escape war and poverty in the Middle East and North Africa. According to the U.N. High Commissioner for Refugees, the 120,000 people addressed under the new system would account for about 20 days worth of arrivals. So it seems likely that the crowds gathered in the Balkans and Turkey outside the increasingly fortified gates of Europe will continue to grow.